In an attempt to be focused and maintain a biblical standard through which I speak, I want to make certain of my purpose in this writing. I want to disclose the futility of worldly means to a biblical end in relation to marriage, suffering, joy and affection. 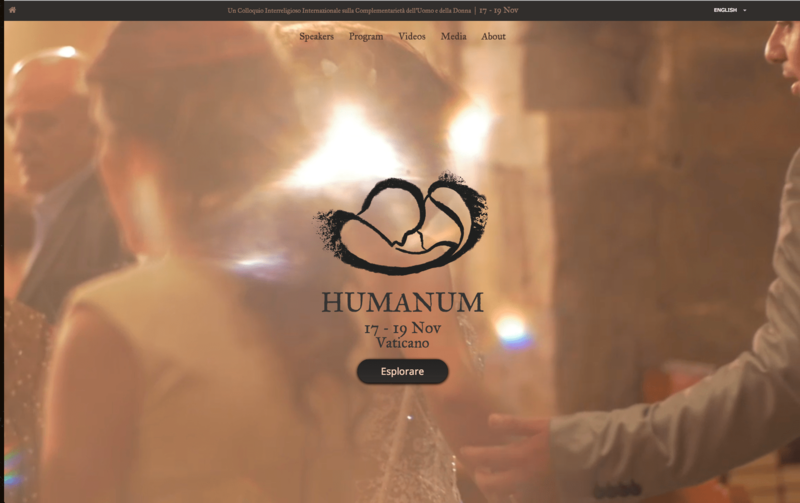 Today, the “Humanum” convened at the Vatican, “The Complementarity of Man and Woman: An International Colloquium is a gathering of leaders and scholars from many religions across the globe, to examine and propose anew the beauty of the relationship between the man and the woman, in order to support and reinvigorate marriage and family life for the flourishing of human society.” This gathering of leaders appears to be an attempt to collectively establish a sense of beauty and awe for the “biblical” picture of marriage between a man and a woman. While these efforts are commendable in one respect, the nature of these “Inter-faith” dialog has me somewhat concerned. (OK, more like a lot). I readily counter however that I trust in the awesome and sovereign power of God, who before the world began had intentions for such a meeting. So my faith isn’t discharged or waning by my record here, but rather, my record is for the sake of the body of Christ to have pause to consider the implications. So that I am not guilty of assuming what is not supported with evidence I will elect to do several things: First, I will not endorse or rebuke any member or attendee of the colloquium for each participant in his own conscience will be held to the judge of all men. Second, I am not negating the necessity of a good dialog on marriage and the nature of why so many young women today (referencing today’s speeches from Latin America) are nearly in complete despair that there is any hope of a life-long marriage with a good man. Third, I do not want to appear insensitive to people of other faiths or theologies, but I am speaking from a strictly Christian (Biblical) perspective on this topic. Fourth, I am only going to use what is provided in source from the colloquium’s pages rather than make inference from what may seem “ideal” and “obvious” information. Fifth, I hope to engage my readers in their journey of celebrating the gospel of Jesus Christ, not tear down the efforts to support marriage. Sixth, my aim is remove myself and my congregation from any support for such a dialog in the name of “religion” or “Christ” or the “Church” or “people of faith”, “community of faith,” or the like. Seventh, I will make obvious statements for recollection and do my best to keep commentary from the writing. However, when pressed, I will preach. The Pontifical “Councils” for family, interreligious dialogue and promotion of Christian unity are all councils of the office of the Pope or “Pontiff”. The history of the Papal office reveals that the office of Vicar (replacement of Christ) is the Pontiff (bridge builder.) This means that the one overseeing the mission of these councils considers himself the representative or bridge between God and man. Now I want to look at the mission of the meetings. Does this language of “relationship between” actually indicate marriage or is this an attempt to avoid marital discussion at all? Does the scripture not declare enough doctrine about these things in Ephesians, Colossians, 1 Corinthians etc.? Is this conference really about marriage or an attempt to appease the heat given to Francis on his views on marriage? Is family life successful through the reinvigorating of marriage so that human society can flourish? IF so, then how can these discussions “propose anew” that which is already been examined by God who created it? Is there anything but the gospel that will reveal the power of God in marriage, family and society? Would the “plurality” of these discussion find “unity” when there is obviously not unity? Although I respect every man’s desires, I think there is something grave at work when “leaders” share a stage who are not in unity where the purpose is to find unity. Although many can be unified on the matter’s of marriage and its beauty from a world’s point of view, the church knows the purpose and power of God’s provision in marriage, so heretical views on the gospel create heretical world views on marriage and vice versa. Although opportunity could present itself for discussion and gospel-powered rebuke and correction on doctrine (inclusive of marriage), this colloquium is presented in mass media style with marketing to boot. So it is far short of any personal dialog. Although I appreciate good debate and discourse, I believe the reformers would flip over in their graves to see such a thing, being they gave their lives to combat such blending of beliefs for the sake of any common good. Although the desire to see marriage built, it won’t be by making it pretty again internationally, it will only be by preaching the one true gospel which by design condemns ANY other gospel. Wisdom does not come from religious tradition. The scripture says that Jesus Christ is our wisdom (1 Cor 1:24) which is the reality that birthed my blogging in the first place (Being Wise and More Stupid) in 2006. So, is there anything good to come out of what even the most sound theologian could offer in wisdom for the picture and beauty of marriage? The same would go for cultural experience. Even the weakest of debaters know that appealing to these measures is surely fallacious. The previous experience and wisdom is stated to allow these witnesses to “attest to the power and vitality” of marriage. If marriage (man and woman) is so powerful and vital, then why is it under examination as a problem? I just don’t understand this. Is this attestation just personal experience with their own marriage? What if it is failed? What if it isn’t? How does this make for global change on the matter without the gospel as the core of the purpose of marriage in the first place? Being a catalyst is good if the means are coming to an end that is profitable. For the sake of argument, what if this gathering produced “langage” and “projects” that just turned the world on its head for the sake of biblical marriage (not on the table btw) and everyone never divorced and anything but biblical marriage disappeared. So what? What good is making something look better than it really is? What good is a society who considers itself righteous on this issue when in reality it is the suffering marriages that endure through the covenant of God’s grace that matter. It isn’t about happy-go-lucky utopic unity. It’s about truth whose name is Jesus Christ and that is really what is at stake here. Strengthening the nuptial relationship is not possible without knowing what the nuptial relationship is. It is a microscopic picture of a microcosmic reality of Christ and His church! What can come out of hearing all of these witnesses who will proclaim everything from one end of the spectrum to the other except further divorce from the true faith? From these discussions may come some good truth, but will this be seen in the light of truth vs. error or “everyone’s together.” If it is the latter, we, the church, is in trouble. What do we do when leaders from Evangelical churches who have surely rebuked Francis’ doctrinal errors sit in assembly with him and others who malign Christ and the Word of God? Will this cause further unrest among Baptists especially? What about Jews? What about the Mormons on the panel? What about the Buddhists? Yes, all these and more are represented among this convention, so what will come of it? Should conviction arise, do churches write letters, remove themselves from the missions arm of associations, or just implode? Isn’t there more important areas to put our time and talent? More areas of interest on holy things and the things of salvation and the souls of the lost? Will this conversation be used as a ploy to break down truth or a plow to create a harvest? I have hundreds more questions and I am seriously praying and waiting to see what it is that God has called for in such a gathering. I readily admit that it disturbs me and more so that some of my peers are there. I look forward to hearing what they have to say and by God’s grace I pray I will not enforce my back seat ministry upon their convictions, however, I do say that the church of Jesus Christ should be separate from apostasy.